Look out Volkswagen, Mazda will also have some awesome gauges. 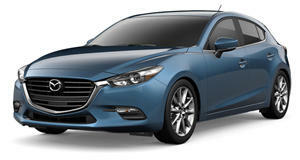 The next-generation Mazda3 has been highly publicized, mainly for its upcoming . This next-generation SkyActiv engine works by igniting a mix of fuel and air using pressure. As a result, the process is more efficient than using conventional spark plugs. This is a huge innovation in the auto industry, but it isn't the only headline for the new Mazda3. We know the new Mazda3 will be inspired by the and the , but we haven't heard much about what the interior will look like. Thanks to some leaked images from , now we do. The three leaked images show an all-digital gauge cluster with two different configurations. The first image appears to show some sort of sport mode with a larger tachometer and a speedometer in the center. This mode places a heavy focus on the engine's rpm and also displays a gear indicator and water temp display on the left and a fuel range calculator and a clock on the right. There is also a more conventional mode with a tachometer on the left and a speedometer on the right. Trip and other information are moved to the bottom of the screen. One of the images does zoom out a bit so we can see other elements of the car. It appears Mazda won't change the steering wheel on the new car, which is fine. Mazda's steering wheel is perfectly usable and not in any need of change. The Mazda3 already had a pleasant gauge cluster, but this new one should give Volkswagen and Audi a run for their money.